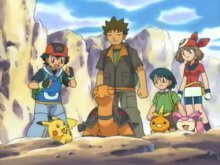 Misty returns to the group. Misty's Togepi evolves into Togetic. May wins the Fallarbor Town Contest. Team Magma and Team Aqua fight over a Meteorite at Mt. Chimney. Ash beats Flannery and earns a Heat Badge. May wins the Verdanturf Contest. Ash defeats Norman and earns a Balance Badge. Ash recalls his Bulbasaur temporarily. May loses the Rubello Contest. Ash's Taillow evolves into Swellow. May's Torchic evolves into Combusken. Ash beats Winona and earns a Feather Badge. May wins the Lilycove Contest.